I wonder what William Shakespeare would think if he knew how successful his plays have become? No doubt he would be ecstatic to know that now, even hundreds of years after his death, they are just as popular and well-read as ever. They are the source of countless reproductions on stage, screen and page, they are favoured by English scholars, and they consistently confuse the school students who have to study his work. They have endured through many different interpretations, with modern day film adaptations, and the well-known (and rather dramatic) BBC productions. They have even been parodied by the Star Wars franchise. Now there is another set of adaptations available that are likely to make most Shakespearean fans (or anyone born after the year 2000) cringe. The OMG Shakespeare! series aims to introduce the playwright’s most famous productions to a new audience, using a medium that appeals to the age bracket- texting. At the time of the writing, there are currently four plays available, each written in text format, complete with abbreviations, emoticon characters, status updates and check-ins. This style takes advantage of the popularity in smartphone and Facebook technology to encourage the younger generation to read these plays and appreciate them in a different way. As with all plays, the characters are introduced at the beginning, but in this instance, the major and minor characters are separated into those who have smartphones (in other words, speaking roles), and those who don’t (non-speaking roles). The play then goes through its paces, separated into Acts and Scenes (just as usual), but the lines are written as texts between each of the characters. There are a lot of emoticons and texting abbreviations littered throughout, and readers will probably recognise most of them. If not, then reading further can help to make sense of what is being said. If all else fails, and you have absolutely no clue what you are reading, then there is a helpful ‘glossary’ at the back of each book to help you decipher what the characters are actually saying. While there isn’t any Shakespearean language in these books, they do follow the general cues of the plays, albeit in a more modern (and dare I say accessible) way. For example, there are a few contemporary variations in place to keep the plays relevant, like some characters getting involved in picture messaging, and others worrying about the amount of cheap texts available on their plan. These inclusions don’t detract much from the plays in question, and actually help to add modern-day characteristics to the roles, helping readers to understand the characters’ personas a little better. 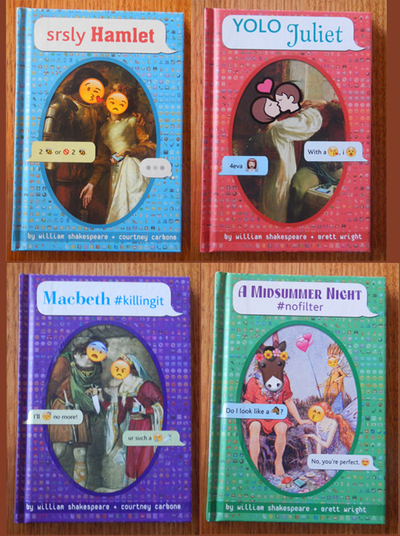 These books offer a unique interpretation of Shakespeare’s plays, and will probably make their introduction to Generation Z a lot easier to handle. As for the rest of us, we’ll probably find the once-difficult Shakespearean language less challenging to understand than this latest reproduction!